Lion facts: get to know more about the king of savanna! The following lion facts are going to help you understand why the lion has always inspired respect, strength and courage. Nowadays, you can still find them in a sanctuary in the State of Gujarat in India and in the sub-Saharan region. In South Africa, there are many reserves where you can see lions either with a self-drive tour or as part of an African Wildlife Safari such as the Kruger park, Pilanesberg National Park, Kalahari Gemsbok National Park and many private reserves such as Phinda Resources Reserve, Sabi Sabi Private Game Reserve, Shamwari Game Reserve, Timbavati Private Game Reserve, Mala Game Reserve, Londolozi Private Game Reserve. Now let's talk about lion facts! 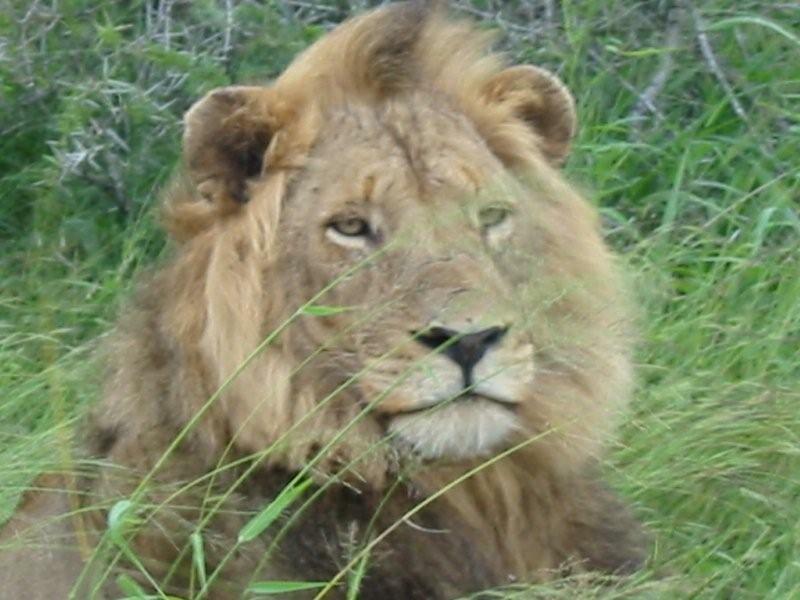 Habitat: Lions are found in savannas, grasslands, dense bush and woodlands. Never in jungle or forest. Diet: Carnivorous (zebras, buffaloes, young elephants, diseased or disabled rhinos, weak hippos, giraffes, mice, lizards, tortoises, warthogs, antelopes and even crocodiles). Most lions drink water daily if available, but can go four or five days without it. Lions in arid areas seem to obtain needed moisture from the stomach contents of their prey. These are lion facts about attack. Lions are very clever and will minimize their risk of getting hurt with dangerous horns by attacking their prey from the back. Lion won’t attack big prey such as giraffe unless they have the support of other males. Lions always follow a good hunting strategy that guarantees them success, 50% of the time. Lions make use of the wind direction to spot their preys. Also, a lion attack often happens near waterholes where animals are a bit less vigilant while drinking and in larger number. Once they locate a group of potential victims, they will encircle them until one of the prey, out of panic, runs away from the group and gets trapped in the middle of the hidden members of the pride. When lions hunt, it’s mostly in group to get large prey which means more food! The lions encircle the prey, knock it and kill it with a bite to the neck. Lions will hunt alone if the opportunity presents itself. They are also expert scavengers by stealing kills from hyenas or wild dogs. They can run up to 60kmph but they are not good on a long distance and need to be fairly close to their faster quarries. They eat games, turtles, rodents, lizards, fishes, birds, giraffes, leopards, cheetah, etc. These male lion facts will make understand better who are this powerful animal. Only when they reach 2 years old, male lions boast thick manes of brown hair that encircles their heads and necks and tends to grow darker with age. It has been discovered that female lions prefer males with bigger and darker manes! The tails of lions is the only one in the cat family with a tassel at the tip. It ends in a horny spine covered with a tuft of hair. They are muscular with less mass bones than any animal of the same size which make them so gracious. Generally, the body is covered with a tawny but there is a white variant in the Timbavati region of South Africa. Lion coat tends to be lighter in colour in hot, arid areas and darker in areas of dense vegetation. Lions are the only cats that live in groups, which are called prides. This big cat loves being in family of about 15 individuals including 5 to 10 all related female with their youngs. The number of males in a pride can very from one to as many as seven, that are usually brothers or pride mates. The highest number of males, the longer the pride will hold. It is unusual for a male to have control of a pride, if he is beyond the age of ten years. At maturity, young males eventually leave and can spend several years as nomads before they become strong enough to establish their own prides by taking over a group headed by another male. The loser will then have to hunt by himself and will then tend to lose weight. 85 percent of the pride’s hunting is done by the females but they are the last ones to eat with their cubs! Male lions patrol the territory, which may include some 100 square miles (259 square kilometres) to protect the pride. They mark the area with urine; roar loud enough to be heard up to five miles (8kms) away to warn intruders and to keep in contact with one another. Lion cubs or baby lion are born blind in litters of two or three cubs that weigh about 3 pounds each. The eyes open in about 2-3 weeks. Some mothers carefully nurture the young; others may neglect or abandon them, especially when food is scarce. A lactating female will allow any cub in their pride to nurse. Cubs start supplementing their mild diet with meat when they are fully mobile at about 4 weeks and become capable hunters by 2 years of age. Lions become fully grown between 5 and 6 years and normally live about 13 years in the wild. About 50% of cubs, which are born throughout the year, survive into adulthood. Most of them are killed by predators such as cheetahs, hyenas, leopards and a male lion that take over a pride. Lion facts about mating will probably make you smile because when it comes to mating, lions are the kings! At the age of 5, the lions start breeding. When a lioness is in heat, they spend their time together and usually don’t eat. They mate for less than a minute, but it does so about every 20 minutes over a period of four to five days. A pair of lions can mate 40 times in a day! Within the pride, the territorial males are the fathers of all the cubs.